The Spartan Spring Marathon season is warming up – events as well as temperature – with 26.2 races in Boston (UK) and Brighton at the weekend. In Brighton STEVE GREEN cut his personal best (PB) by 4 minutes 41 seconds to finish in 3 hours 20 minutes 13 seconds. ANDREW SMITH and SARAH RUSHWORTH ran their first marathons in 3:47:37 and 5:52:51 but MIKE GREEN was the fastest from Fairlands with 3 hours 18 minutes 41 seconds. CHRIS HOLLAND finished the south coast special in 4:15:46. Two Spartans travelled to Lincolnshire this weekend to compete in Boston marathon. RUTH REILLY and CATHY CRAIG both secured second age group places and “Good for Age” times. Ruth finished in superb new personal best of 3:36:53 and Cathy at 65 beat five hours with a new PB of 4:59:36. Their “Good for Age” qualifications mean they could go straight into next year’s London Marathon if they wish. PAUL MAGUIRE ran the Boston U.K. Half Marathon on Sunday in a time of 1:38:34. This was a new PB for him and his first time finishing in under 100 minutes. He was seventh in his age category. 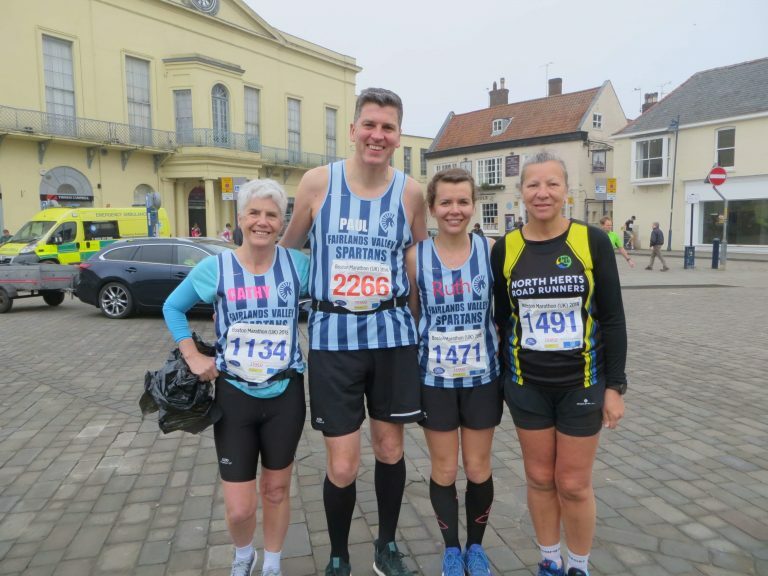 Saturday saw the first decent sunshine for an English road race and Spartans JIM BROWN and PENNY SCHENKEL enjoyed the 51st running of the Victoria Park Open Five Miles. This was a traditional club organised event with an entry fee of only £12 but an accurately measured course, precise start to finish line times, a view across to the Olympic Park and possibly the best post race showers in the universe. Penny ran a new personal best of 45 minutes 4 seconds with Jim coming in with 40:48. Jim said this is the first race this year he’s had salt in his eyes, thinking about Sunday’s London Marathon……..
JAN FRY ran the Thames Valley Spring Half in 2 hours 24 minutes 40 seconds and CHRIS JOHANSEN completed the Battersea Park 5K in 41:16 after a night shift.. Many Spartans will be running the London Marathon starting at 10a.m. this Sunday 22nd April. Why not go and support your local club? This week’s parkruns saw Spartans running at five different locations in two countries. Ashley SCHOENWETTER was first female finisher at Barclay parkrun in Hoddesdon clocking a time of 22:12. Continuing their parkrun tour in New Zealand, Verity FISHER and Danny SUTTON ran Blenheim parkrun on New Zealand’s South Island. There was a small field of 27 runners. Verity finished fifth overall and second female in 23:54. Danny finished in 13th position in 26:35. Congratulations go to Tim ROBINSON who completed his 100th parkrun at Panshanger. Tim was joined by Andy JAY, Thomas SAUKA and Ken JUDE who all finished within 10 seconds of each other. In Oxford Lucy May Field completed her 142nd parkrun finishing in 23:50. 19 Spartans joined 299 other runners to run the 2 lap Stevenage parkrun course. Danny SCANLON finished in 6th position overall in 19:30. Claire EMMERSON was third female in 24.18. Niki PLUMB ran a new PB of 34:39.